We recently approved legislation meant to keep the state’s system of unemployment financially stable. The bill would link unemployment benefits to the rate of unemployment, and ensure the state keeps more money in the unemployment trust fund. The bill is identical to legislation that was put into law in 2015. After being approved by the House and Senate, the bill was vetoed by Governor Jay Nixon. The House then took immediate action to override the governor’s veto. The Senate, which was at a standstill in the final days of session because of a filibuster, did not complete the override motion until the annual Veto Session in September. Because of the timing of the veto override motions, the Missouri Supreme Court later struck down the law. The legislation approved this session by the House is meant to put the law back into effect. It is designed to make sure the state has enough money in its unemployment trust fund so that businesses don’t have to pay a penalty. Specifically, it will increase the minimum amount of money in the fund before employers’ contribution rates decrease. For example, Missouri businesses would see their contribution rates decrease by 12 percent if the fund has a balance greater than $870 million. Missouri is the only state that has been forced to borrow money from the federal government to pay for unemployment benefits during each of the last five economic downturns. As a result, employers have been forced to pay millions of dollars in interest. The bill also ties unemployment benefits to the average unemployment rate so that more benefits are available when unemployment is high. If the state were in a position of high unemployment (9 percent or higher) benefits would be available for 20 weeks. In periods of low unemployment (lower than 6 percent) benefits would be available for 13 weeks. This change is an important step toward ensuring Missouri can afford to help its citizens during times when they are without work. 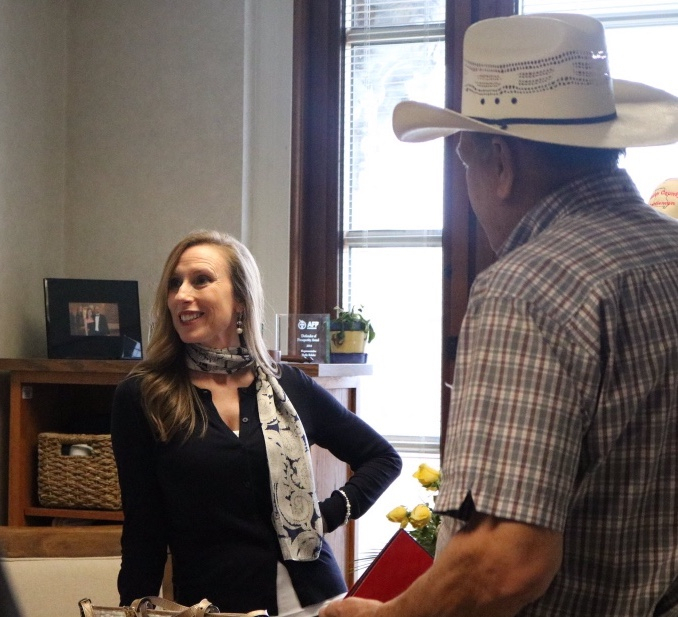 Always great to visit with the Cattleman’s Association! They came by my office last week. It was a pleasure talking about the farms in our state as well as the regulations that need to be fixed. We gave bipartisan support this past week to legislation meant to help reduce the incidence of preterm births and infant mortality in Missouri. We approved legislation that would require the Department of Health and Senior Services to establish levels of neonatal and maternal care available at each birthing center in the state. The bill is meant to provide a referral system that would ensure high risk and other at-risk newborns receive consultation and access to risk-appropriate care. In effect, it would ensure moms and babies receive the right care at the right place. Approximately 25 percent of at-risk newborns in Missouri are born at a facility that is not equipped to meet their needs. Enacting the legislation will allow complex care to be delivered in a more timely fashion to babies and mothers in need. We approved similar legislation during the 2016 legislative session, but the Senate failed to send the bill to the governor’s desk before time ran out. "There’s a lot of using to cover up the pain that you know you have caused others because you can’t get past that guilt, and I know that was a lot of Raychel’s." The opioid epidemic doesn't discriminate. 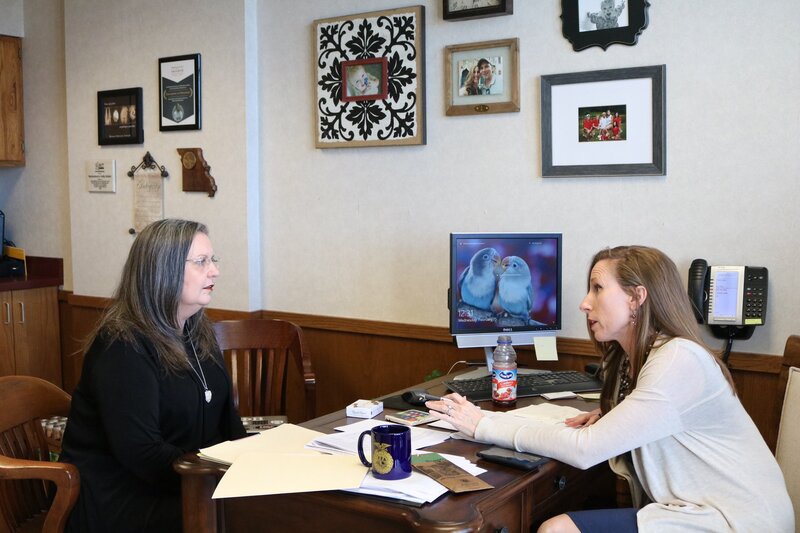 Thank you Alisa with Missouri Net for sitting down with me last week and covering the long-term effects of drug abuse and the scientific data now available. 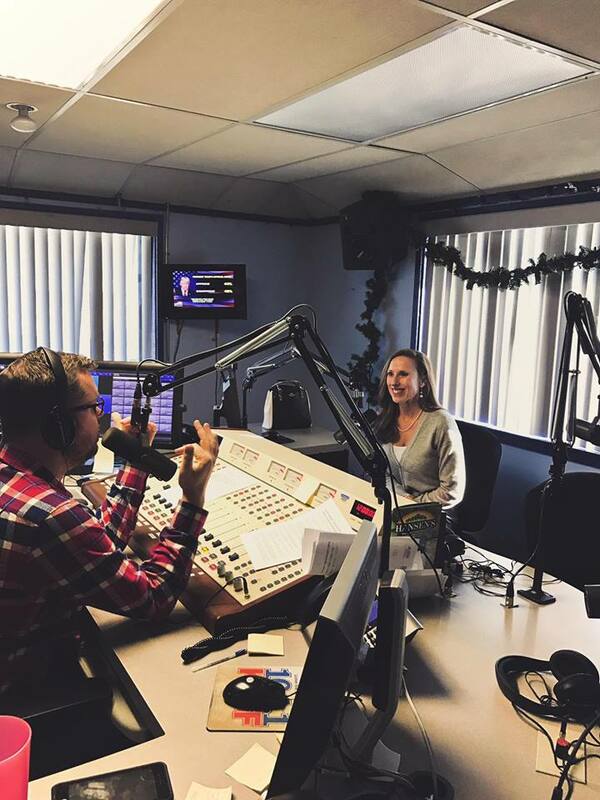 Yesterday morning I was on-air in Springfield at ‪KSGF. Thank you ‪Nick Reed‬ for having me! Capitol Report - Interview with Gov. Eric Greitens, updates on PDMP, PLAs, Blue Alerts and others! On Monday, Governor Eric Greitens and I sat down with Hank Cavagnaro of KFVS 12 to discuss job growth in our state now that Right to Work has passed. To see the full interview click below. I am excited to have the Governor's support for The Narcotics Control Act. On Wednesday, the Governor hosted a live video where he answered questions from the audience. When asked about his thoughts on bringing a prescription drug monitoring program to Missouri he pledged to bring our state in line with the rest. Below is a link to an article from the St. Louis Post-Dispatch and the video. 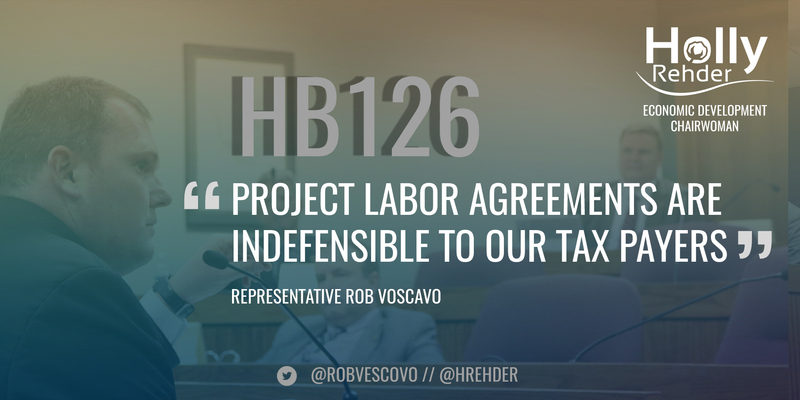 Thursday we approved legislation meant to put an end to project labor agreements (PLAs) and ensure a fair and competitive bidding process for public works projects in Missouri. In effect, the bill would ban PLAs, which ensure public works contracts are almost exclusively awarded to union contractors or contractors who agree to labor union demands. The companion bill has also passed the Senate. Both bills will now begin moving in the opposite house. The bill is important to make the bidding process for taxpayer-funded projects competitive and fair so that Missourians will get a better return on their tax dollars. PLAs raise the cost of construction on average by 18 percent. If approved by both chambers and signed into law, Missouri would join 23 other states that have already enacted laws to limit or prohibit PLAs. We took action this week in the House to reduce the burdensome regulations placed on hair braiders. 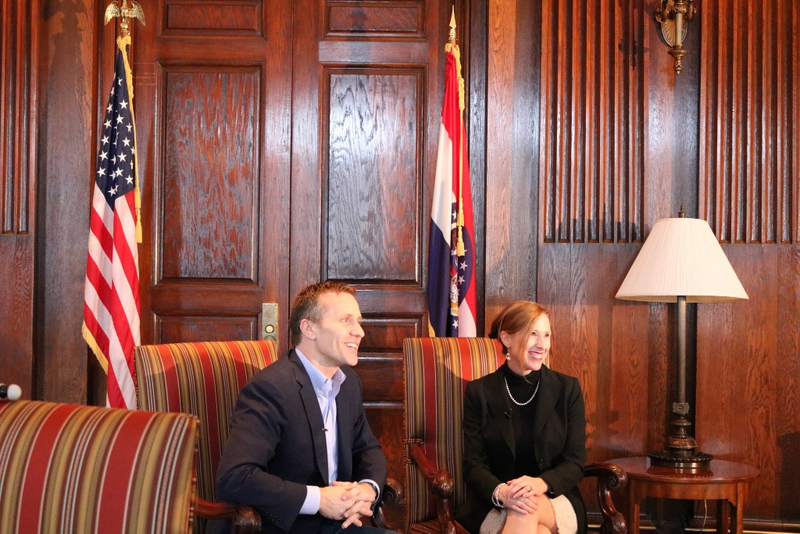 Both Governor Greitens and House leadership have made it a priority to reduce the number of regulations that too often stifle economic development in the state. The legislation passed this week simply specifies that hair braiders do not have to obtain a cosmetology license in order to earn a living. The bill approved by the House specifies that the practice of cosmetology cannot include hair braiding. It does require all individuals engaging in braiding to first register with the State Board of Cosmetology and Barber Examiners. However, the purpose of the registration is only to maintain a listing of individuals who engage in hair braiding for compensation. It does not authorize the board to license or regulate the practice of hair braiding in any way. So many ridiculous regulations on the books. In an effort to ensure law enforcement officials quickly receive the information they need to apprehend individuals who injure or kill peace officers, the Missouri House approved legislation this week to create a Blue Alert System. 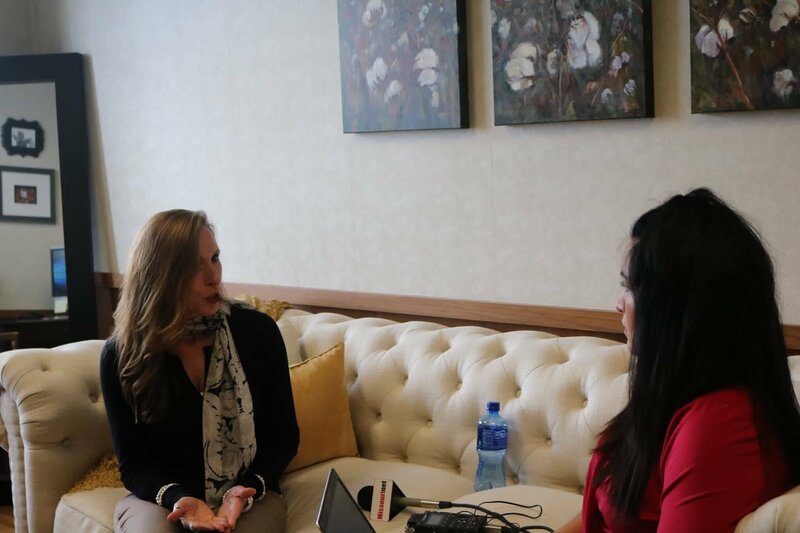 The system is one of the priorities of Governor Eric Greitens, who included $250,000 in funding in his budget proposal to establish the system. Missouri would benefit from its own system so that it can better protect the brave men and women who protect communities across the state. The sponsor of the bill, Rep. Justin Hill, noted the legislation’s bill number, 302, is in honor of an officer who was seriously injured in the line of duty. Ballwin police officer Michael Flamion, whose badge number is 302, was shot and paralyzed from the neck down during a traffic stop in July of 2016. The Missouri House took action this week to deter crimes against law enforcement officials. House members approved legislation that would create enhanced penalties for individuals who assault officers of the law. The legislation would increase by one degree the penalty for voluntary or involuntary manslaughter; first- or second-degree property damage; unlawful use of a weapon; rioting; or first-degree trespassing; when those crimes are committed against a law enforcement officer. As an example, voluntary manslaughter is a class B felony under current statute, but if HB 57 becomes law, voluntary manslaughter committed against a law enforcement officer would see the penalty increased to a class A felony. The enhanced penalties are necessary because crimes against law enforcement officers have increased in recent years. They also said the bill would reinforce the legislature’s commitment to law enforcement. 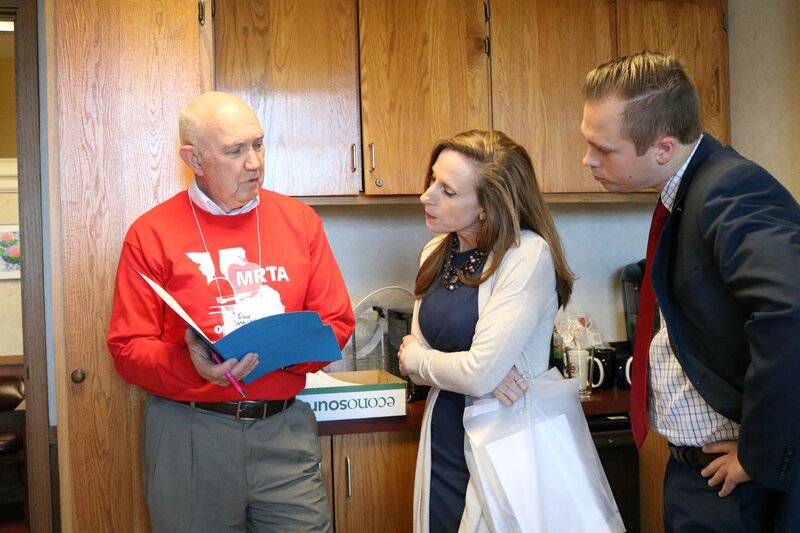 Thank you so much to those who participated in the Missouri Advocacy Day. 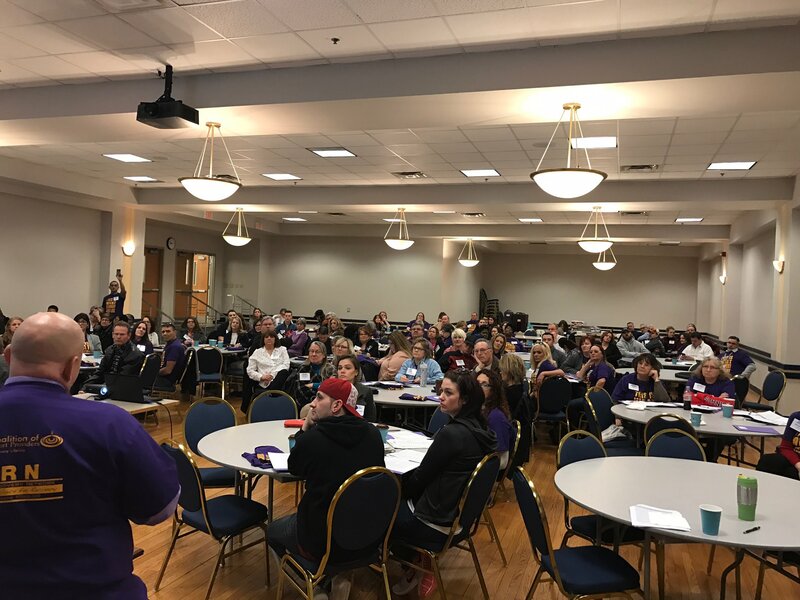 It was so encouraging to see almost 200 advocates in the morning ready to educate lawmakers on addiction/mental illness. I know how nervous it can make you when coming to the Capitol for the first time! So proud of you all for coming and talking about these important issues with your legislators. Your voice matters! A special thank you to everyone who visited my office this week. If you are ever in the Capitol during session, you are more than welcome to come and say hello! Missouri Municipal League is in the Capitol today and I had the pleasure of speaking with Mayor Karen Best and how PDMP affects her county! Thank you to the Missouri Retired Teachers Association for coming by my office today! Great info; but I sure missed seeing Mrs. Marlys Smith this year. 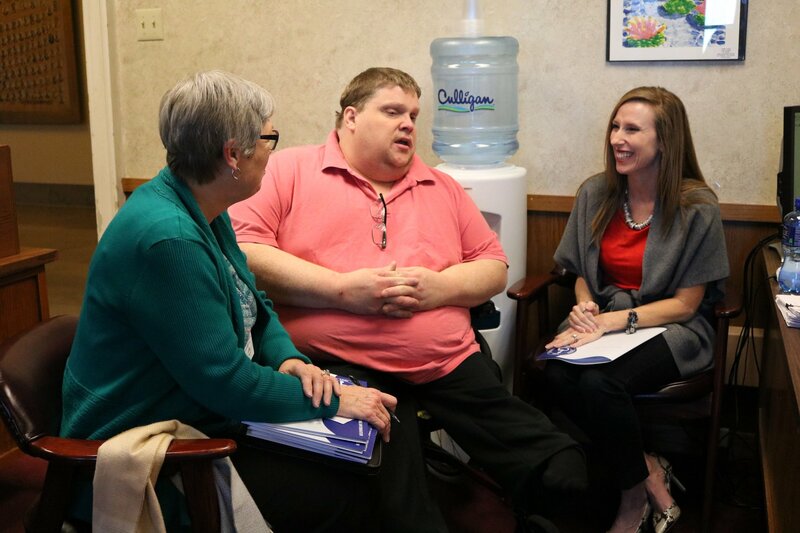 Thank you SADI Center for the services you provide throughout SEMO - helping those with disabilities to remain comfortable in their homes. 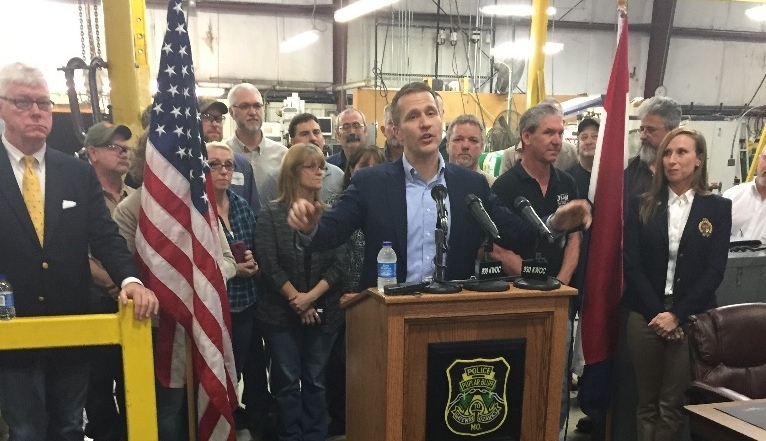 Missouri is now the nation’s 28th Right-to-Work state as Governor Eric Greitens has signed SB 19 into law. This week I was honored to travel with the Governor to Springfield and Poplar Bluff before returning to Jefferson City for a series of ceremonial bill signings and to tout the benefits of the new law that will take effect August 28. During our tour it was so exciting to see those who have worked on this legislation for many years. My dear friend, Peter Kinder (shown below at the Poplar Bluff signing), Lt. Governor Mike Parsons, Senate Pro Tem Ron Richard, so many representatives including former representative Eric Burlison who has carried this for the past several years. Ms. Mary Hill joined us in Springfield and Jefferson City. She has been a driving force on this issue for many years. I also had a special drop-in at my office this week, former representative Norb Plassmeyer who served our state from 1977 - 1980 and was one of the folks working on the ballot drive so many years ago! As Gov. 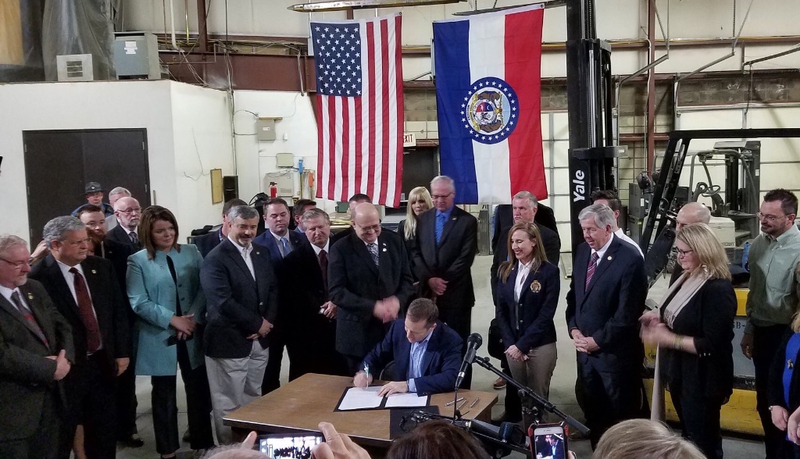 Greitens told a group of legislators and onlookers before signing the bill in the State Capitol, “Passing Right-to-Work sends a very clear message that the people of Missouri are ready to work and Missouri is open for business.” This is truly a historical moment for our state! I testified in the Senate hearing on Thursday regarding the need for the Narcotics Control Act, known as prescription drug monitoring. I'd like to thank Senators Jill Schupp & Dave Schatz for fighting for this important medical tool that Missouri alone does not have. Without these wonderful senators taking on this fight in the senate, our chances would be slim. I cannot thank them enough! 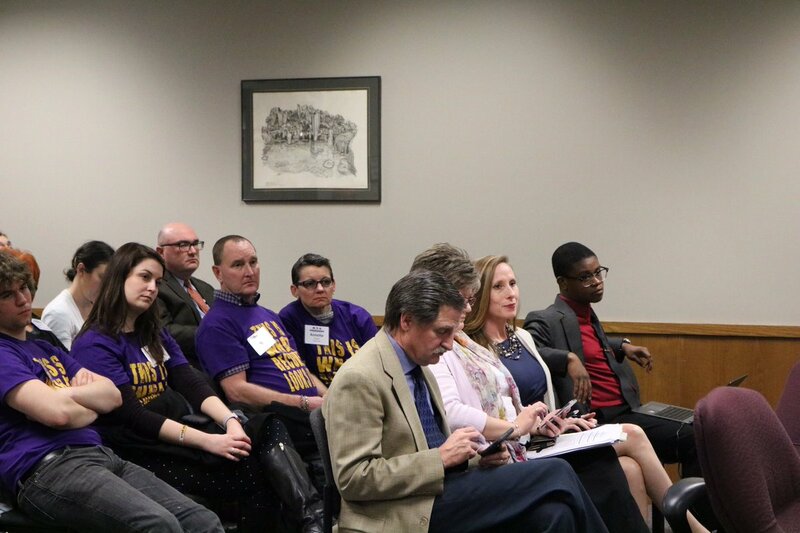 After my testimony I was joined by several Missourians testifying in favor of the bill. 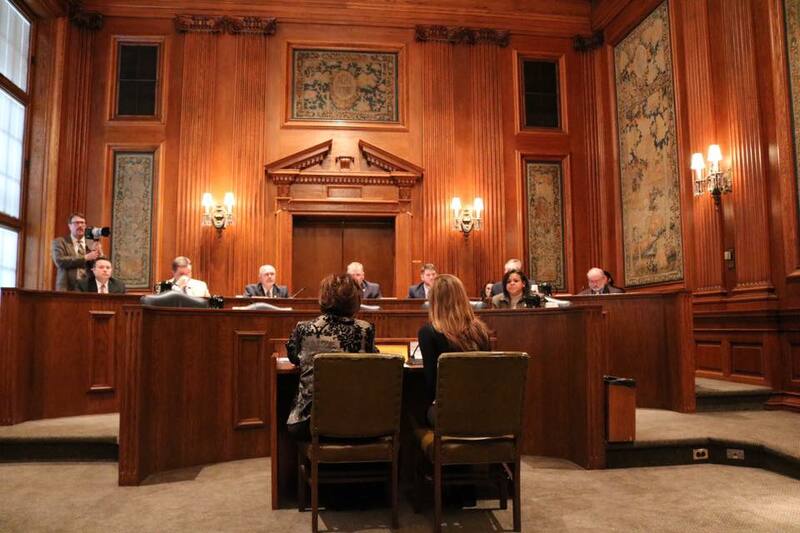 With no opposition in testimonials, the Narcotics Control Act was voted out of the Senate Committee unanimously and we are now on step closer to a safe and strong Missouri with a prescription drug monitoring program. I will keep you updated! We send out updates through the week just on the process of the Narcotics Control Act. If you would like to get those emails as well, please just shoot me an email at holly@hollyrehder.com. We continued our labor reform efforts this week by passing “paycheck protection”. You probably remember I have carried this legislation for the past two years. 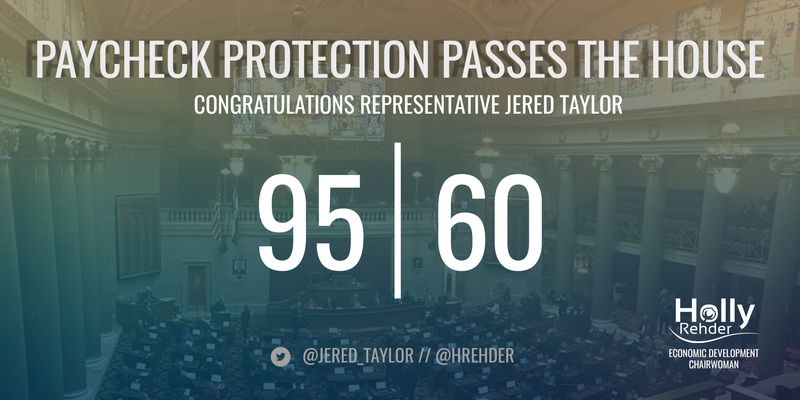 Very excited to have a colleague from Southwest Missouri carrying it this year, Rep. Jered Taylor. Passing Paycheck Protection would simply require state union workers to opt in annually verses having to opt out if they ever want out of the union. This was actually a problem brought to me by a Sikeston lady who had tried multiple times to get out of the union at the social services office. From her experience, this is not an easy process. Changing the law to an annual opt in, just like how we renew our insurance benefits each year, it takes the pressure and frustration out of the current process. However, you can still get out of the union throughout the year by the current method. This is a matter of protecting the rights of workers and giving them a say in where their money goes. Unions sometimes support political causes not endorsed by their membership, if this is the case as it was with my constituents, getting out doesn't have to be a long, drawn out process. The bill now moves to the Senate for consideration. This is the bill that we over-rode the Governor's veto last year in the House but failed by one vote in the Senate. This year, if we get it through both Houses, our governor has said he will sign it! Many cemeteries across the state are falling into disrepair because of a lack of funding for maintenance. The Missouri House took action this week to address the problem by passing legislation that would allow for more investment options with the goal of making more funds available for upkeep. Many cemeteries have endowed monies placed in CD’s in local banks accruing interest, and in many cases, the stewardship of these endowed monies has been legally appointed to county commissions. Each year, the commissioners allocate just the income from interest accrued for the funding of maintenance costs. However, current state statute does not allow for the distribution of any of the principal. Because of extremely low interest rates, many county commissions are in a critical situation with no interest funds available to pay for maintenance. The legislation approved by the House this week (HB 51) would authorize county commissions that are trustees for a cemetery trust fund to utilize investment managers to invest, reinvest, and manage fund assets. Supporters of the bill note that many cemetery trust funds hold hundreds of thousands of dollars, but the few investment vehicles currently authorized do not generate enough revenue to pay for maintenance. HB 51 would provide county commissions with more investment options. Also working its way through the committee process is legislation (HB106) that would authorize county commissions to use a part of the principal of a cemetery trust fund for the support and maintenance of the cemetery when the net income of the trust fund is insufficient for those purposes. The bill is currently under consideration by the House Local Government Committee. Until state statutes are revised or interest rates increase, local cemetery boards, local communities, and descendants of buried ancestors will need to take action and contribute monetarily through donations or fundraisers to increase endowment funds. It is important to note that no funding comes from state taxpayers’ resources. Please share with your friends and encourage them to sign up for our reports. Stop by or contact us anytime by calling (573) 751-5471, or via email at holly.rehder@house.mo.gov or tyler.hobbs@house.mo.gov. I'm so very excited to tell you all that we gave final approval TODAY to the Senate's Right to Work version, making Missouri the nation’s 28th Right-to-Work state! The bill approved by our General Assembly will simply ensure employees are able to decide whether to join a labor union instead of being forced to join as a condition of employment. The bill also includes a clause that will exempt existing union contracts. Specifically, it exempts any current agreement between an employer and labor organization from the restrictions in the bill. However, the provisions of the bill will apply to any current agreement that is later renewed, extended, amended, or modified. For years we have highlighted the importance of giving workers the freedom to decide whether to join a union, and the increased level of accountability that union members would see from their unions as a result. Also noted many times was that Missouri is in fierce competition with other states for jobs and that Right-to-Work will make the state a more attractive location for businesses seeking to relocate or expand. Statistics show states with Right-to-Work experience healthier job growth than those without. According to the U.S. Bureau of Economic Analysis, Right-to-Work states added 8.6 percent more new jobs in the last decade. During the same time period, non-Right-to-Work states grew employment by only 5 percent. During that same time, GDP in Right-to-Work states increased by 15.3 percent. In contrast, non-Right-to-Work states grew by 11.9 percent. Supporters have also said that Right-to-Work does not negatively impact worker pay. They cite U.S. Bureau of Economic Analysis statistics that show wage growth in both Right-to-Work and non-Right-to-Work states increased by the same margin of 7.7 percent. When it is signed into law by Governor Greitens, the provisions in the bill will take effect August 28 of this year.